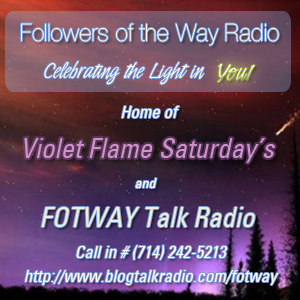 FOTWAY Radio – Followers of the Way Radio – Celebrating the Light in You! FOTWAY Radio is talk radio where we discuss many different topics that cover the whole gamut of “Where are we and where are we Ascending too!” There’s definitely something here for any spiritually enlightening Being so tune-in and in-tune and check out FOTWAY Radio! FOTWAY Radio is currently broadcasting interviews from time to time and we are working on getting our regular time schedule back – aiming for mid to late April. We have some wonderful shows on the Horizon and some wonderful shows in the Archive. Archived shows will soon have their own pages on the FOTWAY site and we will link to them here! Check out FOTWAY Radio on Blog Talk here. < Listen live or to the Most Archived Shows right here! FOTWAY broadcast Violet Flame Saturday’s every Saturday at 10AM Pacific, 11AM Mountain, 12PM Central, 1PM Eastern, 6PM London time – We also have a talk show that will be starting up again in October with amazing interviews … with amazing people on week nights. You can check out the archives at the link below (and browse previous pages) to tune in and in-tune to past episodes of FOTWAY radio and our interviews with great people, as well as Violet Flame Saturday’s. FOTWAY Radio: Celebrating the Light in You! Interviews on Tuesday’s and Thursday’s This show is for those who are interested in and/or who follow the Way within, the Tao, the Light of Divinity and Oneness. The Way seers, the Way walkers, the followers of the Way, the keepers of the flame, the Way of the sage, the Way of the Christ, the Way of the Buddha, the Way of the Ascended Masters and he Violet Flame, the Way of Ascension, the Way of Liberty and Creative Self expression, those who choose to magnify the Light in Life, the lovers of Truth and the Ones who choose to Be.